When moving into a new home, comfort is essential and your indoor climate plays a big role in your overall comfort level throughout the home. Unfortunately, smaller homes cannot accommodate full-scale HVAC systems, often leaving homeowners at a disadvantage in terms of maintaining ideal indoor temperatures at the push of a button. This is where innovative packaged units come in. There is some truth to the saying “good things come in small packages,” particularly as it applies to powerful heating and cooling systems within a single packaged unit. As the leading provider of packaged units in Jackson, WI and nearby areas, Jackson Hardware Heating & Air Conditioning offers sophisticated solutions for homeowners with limited indoor space. A packaged unit is a heating and cooling system integrated into a single unit. This unit matches the functionality and energy efficiency of standalone furnaces and air conditioners. It is typically installed on the roof or at the side of the home, with no indoor furnace or air handler required. Packaged units stand out not only in their versatile functionality year-round but also their durability and reliable operation for the long term. Specializing in the industry’s best packaged units, we are proud to offer sophisticated all-in-one HVAC solutions to homeowners with a crawlspace instead of a basement. 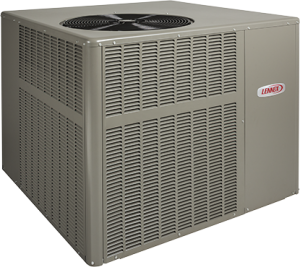 Provided exclusively by Lennox, our products are available in gas/electric, electric/electric, heat pump, air conditioner and dual-fuel options: our knowledgeable team can help you select the right product for your individual needs. Regardless of your selection, our packaged units are built for reduced vibration and quiet operation, as well as optimal energy efficiency. Our packaged units are specially designed for quick and efficient installation and our service technicians are just one call away at (262) 677-3477. With numerous years of industry experience, we have the skill and advanced knowledge to handle any installation or repair issue that comes our way! As an authorized Lennox dealer since 1919, we have serviced Jackson, Grafton, Cedarburg, Mequon, West Bend and all of Washington and Ozaukee counties for over 27 years. If you are looking to install a state-of-the-art packaged unit in your Jackson home, or anywhere in the surrounding Washington and Ozaukee counties, please contact us today! Your local experts at Jackson Hardware Heating & Air Conditioning are always available - no matter what time of day or night, you will always speak with a live person when you call us. For priority service or emergencies, you can reach us by calling (262) 677-3477. We are available 24/7. We look forward to helping you save space without compromising the comfort of your living environment.